In most sales organizations, commissions are an integral part of the extrinsic rewards program, contributing significantly to the sales person’s compensation package. Sales commission is usually calculated as a percentage of revenue generated by the sales person. What if your sales team is enabled with an option to check their sales commission associated with each quote? The first post in 'Automate using Functions' series unravels just that. Let's assume a case where a sales person gets a commission based on the quantity of products she/he sells. I'm sure you agree that this is an important practice in many companies. Internally, there must be records to know just how much commission the sales person received. 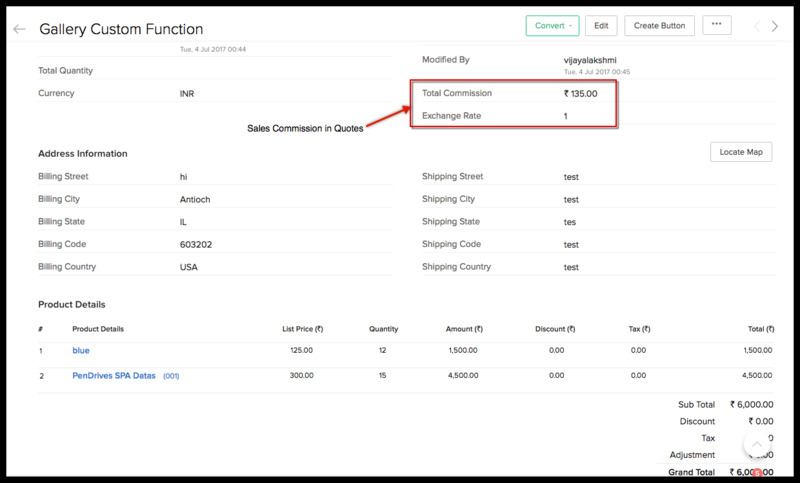 Zoho CRM tracks the commission associated with the sale of each product in ‘Commission Rate’, a standard field in the Products module. Using Functions, this information is pushed to the Quotes module. The commission associated with each line item of the quote is calculated and summed up to find the overall commission associated with that quote.The resultant value is then updated in a custom field in the Quotes module. Pretty convenient right? Change the "[field Id]" or "[module]" name to any other module or field name(Custom modules or fields) to fit your requirement. Update the commission associated with each product in the Products module. Create a custom field in Quotes module where the commission associated with the quote gets updated.